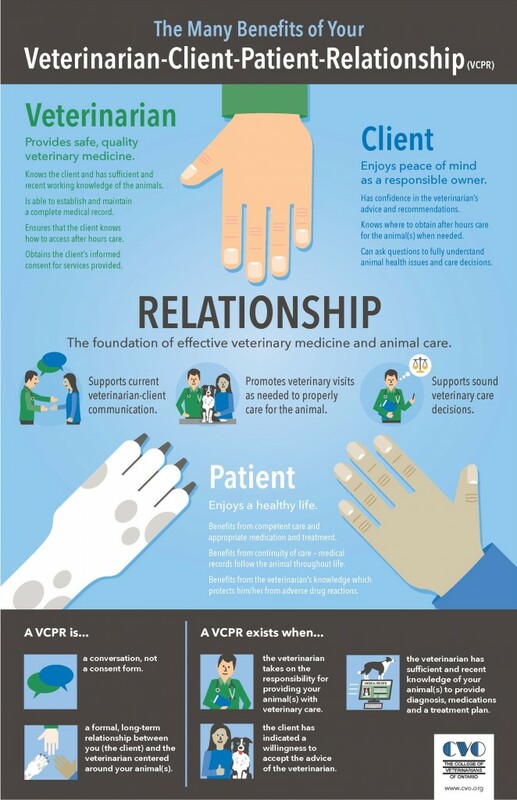 A Veterinarian-Client-Patient-Relationship is the foundation of effective veterinary medicine and animal care. It is made up of a formal, long term relationship between you (the client) and the veterinarian, centered around you and your animal. As a responsible animal owner, it is important that we work together for your animal’s health. Our relationship revolves around your animal’s well being and ensures you have access to our services and veterinary care when necessary. The relationship is focused on your anumal’s well being and it ensures that we, as your veterinarian have sufficient and recent working knowledge of the animal to deliver safe, quality veterinary medicine. Effective Communication is a central aspect of the successful delivery of veterinary medicine. As your veterinarian, we will discuss diagnosis, medications and a treatment plan. It is important that you fully understand your animal’s health issues to make appropriatedecisions which may help your animal live a long and healthy life! A regular examination ensures that as your veterinarian, we have sufficient and recent knowledge of your animal to provide a diagnosis, medications and a treatment plan. Our relationship ensures your animal benefits from competent care and appropriate medication and treatment.